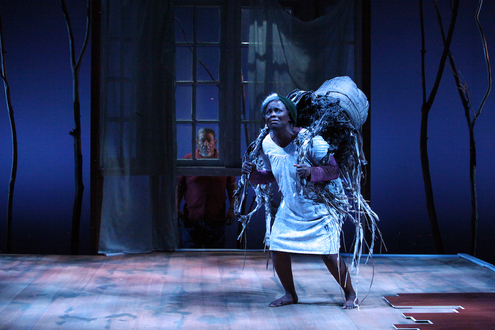 Nancy Moricette as Abasiama Ufot in Mfoniso Udofia's In Old Age at the Magic Theatre. 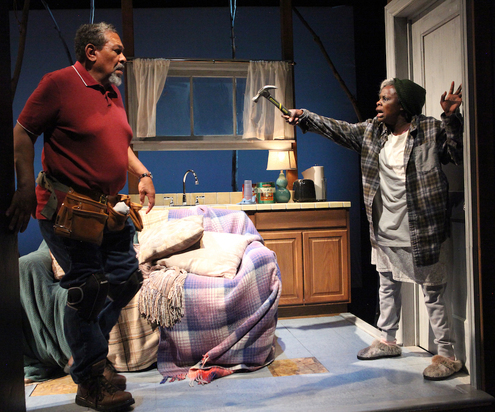 Houses are places to make and hold memories, good and bad, and in playwright Mfoniso Udofia’s In Old Age, currently in its world premiere at the Magic Theatre, a family home is the setting that shows how much impact a place’s history can have on its occupants. 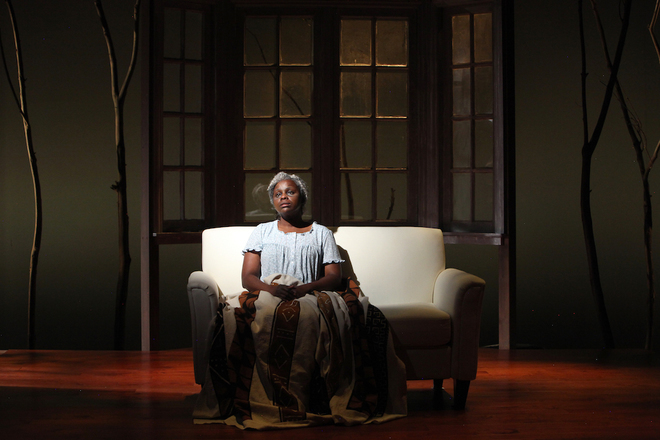 The play is the fifth in what will ultimately be a nine-play cycle about the Ufot family, and it focuses on the matriarch, Abasiama, who arrived in America as an immigrant from Nigeria when she was a young woman. She is now in the last chapter in her life, which she spends in a house in Worcester, Massachusetts, that her family has inhabited for decades. 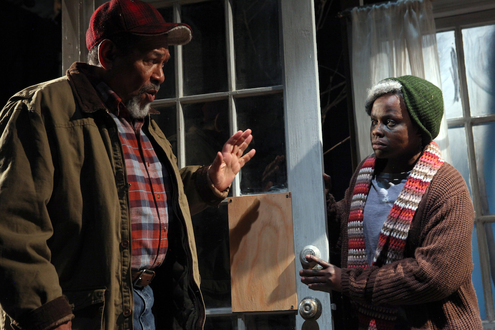 The play opens when Azell Abernathy arrives at Abasiama’s house to redo a floor. She isn’t expecting him and reluctantly answers the door to find out what he wants. It turns out that her adult children have hired and already paid him to do some much-needed work, and despite her initial resistance, Abasiama allows Azell inside to make the improvements. As the work on the floor develops, so does the relationship between Abasiama and Azell, who bicker, argue and unknowingly provoke each other to resolve events in their individual histories that prevent them from finding the peace they need to enjoy their elder years. At the same time, the house comes to life with bangs, creaks and groans, reflecting Abasiama’s interior turmoil, as it attempts to purge the traumatic memories it holds. Nancy Moricette plays Abasiama in a complex portrayal that shows her character’s intelligence, her resistance to the possibility of Azell’s friendship and her anger and passion as she makes a decision and endures a cathartic experience that will change her life. She’s also a blend of two cultures, with elements of her Nigerian heritage an integral part of her character, even though she’s spent most of her life in the United States and been shaped by its values and customs as well. Steven Anthony Jones portrays Azell, who is clearly American, although his African roots also emerge when he channels the native language of Nigeria, showing that he and Abasiama share common cultural origins despite their differences. His performance is powerful, as he erupts into fits of anger but also has periods of insight and understanding as he confronts his inner demons. Abasamia’s repeated question, “Are you a good man?” turns out to have special meaning for both of them. Victor Malana Maog directs for the first time at the Magic Theatre and brings Udofia’s vision to life in a production rich with details and imagery. A scene that takes place during a storm, for example, has Azell standing on the outside looking in, trying to understand the meaning of what’s happening inside the house. The entire play takes place in Abasamia’s living room, and the set, designed by Andrew Boyce, gets frequent changes to show progress to the floor. York Kennedy’s lighting design is masterful in its depiction of different times of day, whether it’s sunlight, moonlight or a raging thunderstorm, and Sara Huddleston’s sound design also plays a crucial role, providing the multitude of sounds emanating from the house, defining its character and making the magic realism at the heart of the story effective. In Old Age is the fifth and newest play in the Ufot Cycle. Udofia, a first-generation Nigerian storyteller, has yet to complete the remaining four and give them titles. 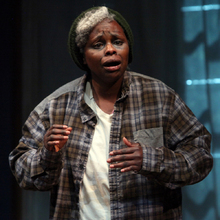 Each play stands on its own, and audiences are able to enjoy In Old Age with or without seeing the previous plays. The program, however, gives a summary of the first four and also provides an Ufot Family Tree for those who want to know more. It’s a moving play that shows how one’s personal history impacts the present and how human connection makes a difference. 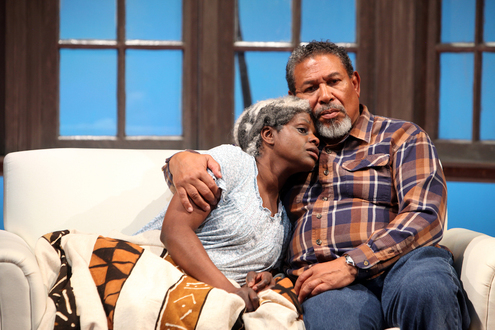 In Old Age runs through April 21 and is approximately 90 minutes without an intermission. For more information or to purchase tickets, go to magictheatre.org or call 415-441-8822.